Incorporated March 11, 1971 with a population of 2,284, the town has enjoyed a steady growth to its current population of approximately 22,000 persons. 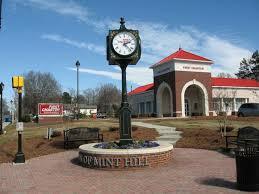 The town, following tradition established when the Mint Hill community was first settled in 1750, has tremendous community spirit and pride. Within the town are many churches and excellent schools. Also, there are recreational facilities including private and public golf courses and country clubs. Primarily a residential community, the business district has shown intensified development in recent years with approximately 285 businesses and professional services available.